The High Level API (HLAPI) is a system for building multiplayer capabilities for Unity games. 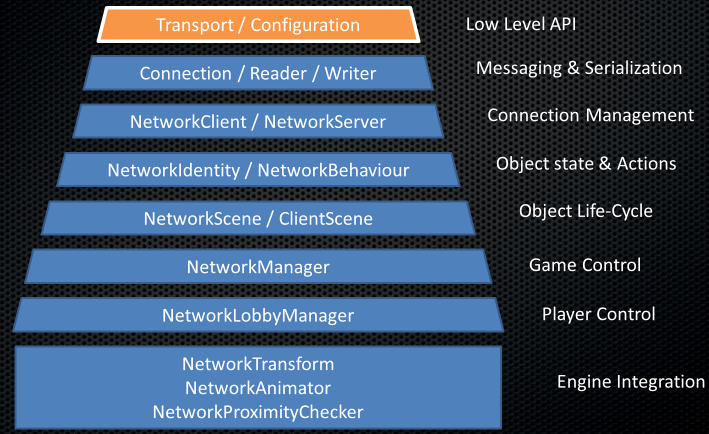 It is built on top of the lower level transport real-time communication layer, and handles many of the common tasks that are required for multiplayer games. While the transport layer supports any kind of network topology, the HLAPI is a server authoritative system; although it allows one of the participants to be a client and the server at the same time, so no dedicated server process is required. Working in conjunction with the internet services, this allows multiplayer games to be played over the internet with little work from developers. HLAPI는 Unity에 내장된 새로운 네트워킹 커맨드 집합으로, 새 네임스페이스인 UnityEngine.Networking 안에 있습니다. 그리고 사용 편리성과 반복 개발에 초점이 맞춰져 있고 멀티플레이어 게임에 유용한 다음과 같은 서비스를 제공합니다. HLAPI는 기능을 추가하는 일련의 레이어로부터 빌드됩니다.